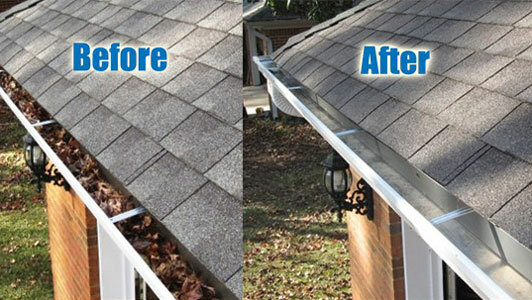 Gutter cleaning is a very important part of your ongoing home maintenance needs. Clogged gutters and downspouts can lead to water damage such as rotten wood work around your home, water entering your basement or crawl space, damaged landscaping, and even provide a place for ants and other insects to live. At AAA Glass Act we hand scoop all the debris out of your gutters and always clean and clear any and all clogged downspouts ensuring you peace of mind that your gutters are working properly. We clean up all debris caused by the cleaning either by blowing the debris into a wooded leafy area or by bagging all of the debris and leaving this in your yard waste container. We also offer our services to haul off all debris and take it with us. Estimates for gutter cleaning can be given easily over the phone or by email. Our estimates are based on the number of stories your home has, type and pitch of roof, and whether or not there is any type of gutter guard systems we may have to work with. We have a 100% satisfaction guarantee on all of our gutter cleaning work. We also provide Moss Treatment for roofs using a process that doesn’t utilize the need for a pressure washing which can void your roofing warranty and take off up to 5 years of your roofs life per cleaning…NOT RECOMMENDED! 1. Gently agitate the moss from your roof using a metal bristle brush. 2. 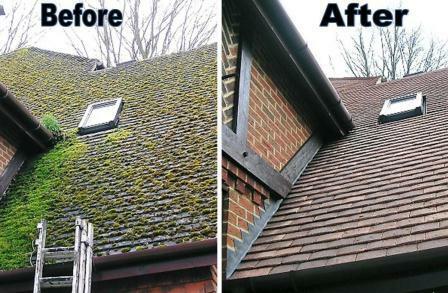 Airblow or sweep moss into gutters. Contact us today at (425) 512-5323 to schedule your gutter cleaning and moss control appointment.